Emilie Halpern, Mysticeti, 2012, silver gelatin print, 26 1/2 x 39 1/2”. The key to Emilie Halpern’s second solo exhibition at this gallery turns upon the relationship of what one encounters on the floor to that on the walls. On the floors of two separate downstairs rooms lie two entirely irregular objects: on one side, a smattering of twenty-nine empty emu eggs, some of which have been smashed, and on the other, a large puddle containing four liters of ocean water, freshly poured each morning. The presence of these thoroughly corporeal materials—the one invoking Halpern’s own recent experience with pregnancy, the other the measure of water required to fill human lungs––brings physical traction to to the artist’s larger body of work on show. Like many emerging artists in the tradition of Conceptualism, Halpern works with a combination of sculpture and photography. Her elegant sculptures include understated objects such as Lightning Rod, 2012, a slender, thoroughly oxidized shaft, and non-objects such as Octopus, 2012, three inch-wide holes cut in a straight line through a door, a half-wall, and then a window, receding from front to back of the gallery. Her photographs are similarly restrained. 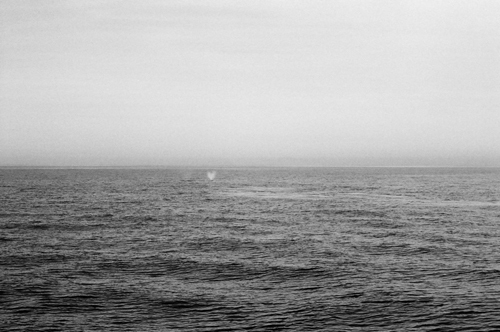 Solar Delay, 2012, for instance, is a “white” silver gelatin print created by exposing the negative to eight minutes of sunlight, and Mysticeti, 2012, is an expansive, horizontal seascape interrupted only by a faint spray of water erupting at an indeterminate distance. Such works flirt with the insular universes called forth in their formal correspondence with Hiroshi Sugimoto’s still seascapes or even Joseph Beuys’s rugged Blitzschlag mit Lichtschein auf Hirsch (Lightning with Stag in Its Glare), 1958–85. But Halpern’s work does not seek to inhabit or fashion its own inner worlds, whether meditative or social, respectively. As evinced by the very range of her stoic vertical works and more affective horizontal ones on the gallery floor, Halpern’s art nestles into the productive fissures between experience and imagination, unfixing object and viewer alike in the matrix between life and death.